Invasion of Astro-Monster (怪獣大戦争, Kaijū Daisensō, lit. 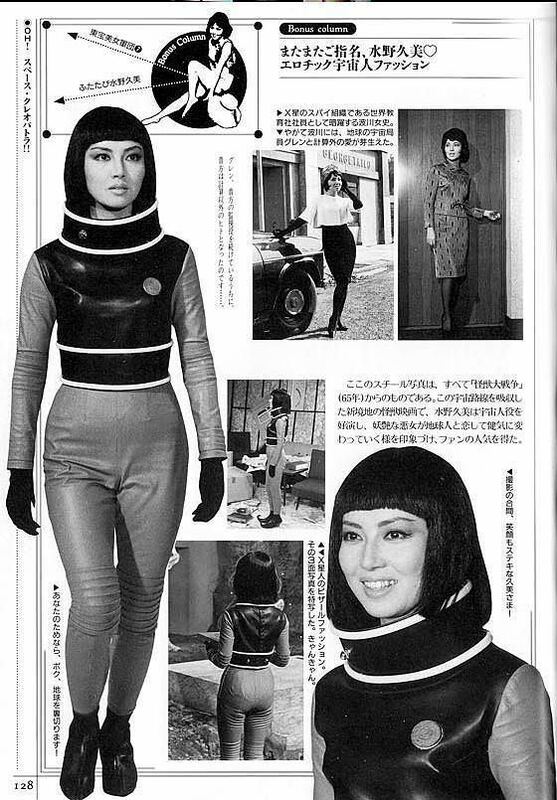 The Giant Monster War) is a 1965 Japanese-American science fiction film directed by Ishirō Honda. It is the sixth film in the Godzilla franchise. The film involves the discovery of Planet X, which leads to an American-Japanese mission into space where the explorers who run into Aliens who state that they are under attack from a power creature named Monster Zero. The aliens propose a deal with astronauts to borrow Godzilla and Rodan to get rid of their monster, and in return, they will cure all diseases on Earth. This plan is a cover for the aliens to invade earth after it is free of Godzilla and Rodan. Invasion of Astro-Monster was the fourth film in the Godzilla series to receive production suggestions from American producer Henry G. Saperstein which led to new introductions to the film and the inclusion of an American actor Nick Adams. The film was released five years after its Japanese premiere in the United States with minimal cuts where it was released on a double bill with War of the Gargantuas. In the year 196X, two astronauts, Fuji and Glenn, are sent to investigate the surface of the mysterious "Planet X". There they encounter advanced and seemingly benevolent human-like beings called the Xiliens and their leader The Controller. The aliens usher the astronauts into their underground base, and moments later the surface is attacked by a creature the Xiliens call "Monster Zero", but which the astronauts recognize as King Ghidorah, a planet-destroying monster that had attacked Earth once before. 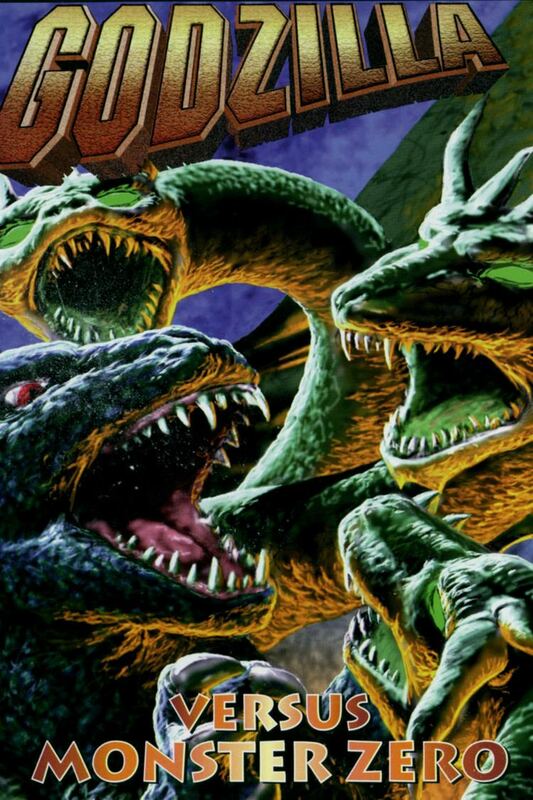 The monster eventually leaves, but the Controller states that Ghidorah has been attacking repeatedly, forcing them to live underground in constant fear. He requests to borrow the Earth monsters Godzilla and Rodan to act as sentries against Ghidorah's attacks, in return for the cure for cancer (the English dub says the formula can cure any disease). The astronauts return to Earth and deliver the message. Meanwhile, an inventor named Tetsuo has designed a personal alarm that emits an ear-splitting electric siren. He sells it to a businesswoman named Namikawa, but she disappears before paying him. Tetsuo is romantically involved with Fuji's sister, Haruno, but Fuji disapproves and berates him for getting scammed. Tetsuo sees Namikawa with Glenn and later follows her, but he is captured and imprisoned by Xilien spies. Glenn and Fuji begin to worry that the Xiliens may have ulterior motives. Their suspicions appear confirmed when three Xilien spacecraft appear in Japan. The Controller apologizes for coming to Earth without permission. The Xiliens locate Godzilla and Rodan, both sleeping, and use their technology to transport them to Planet X. They also bring Glenn, Fuji, and the scientist Sakurai with them. After a brief confrontation, the Earth monsters succeed in driving Ghidorah away. Glenn and Fuji sneak away during the battle and encounter two Xilien women, both of whom look identical to Namikawa. Xilien guards confront the astronauts and bring them back to the Controller, who reprimands but does not punish them. The astronauts are given a tape with instructions for the miracle cure and sent home, leaving Godzilla and Rodan behind. The tape is played for the world's leaders, but instead it contains an ultimatum demanding that they surrender Earth to the Xiliens or be destroyed by Godzilla, Rodan, and Ghidorah, who are under the aliens' control. Glenn storms into Namikawa's office and finds her in Xilien garb. She admits that she is one of their spies, but confesses that she has fallen in love with him. Her commander arrives to arrest Glenn and executes Namikawa for letting emotion cloud her judgment, but not before she slips a note into Glenn's pocket. Glenn is taken to the same cell as Tetsuo. They read Namikawa's note, which explains that the sound from Tetsuo's invention disrupts the Xiliens' electronics. Tetsuo has a prototype with him, which he activates, weakening their captors and allowing them to escape. Sakurai and Fuji build a device to disrupt the Xilien's control over the monsters. Glenn and Tetsuo arrive to share the Xilien's weakness. As the monsters attack, Sakurai's device is activated and the sound from Tetsuo's alarm is broadcast over the radio. The invasion is thwarted and the Xiliens, unable to fight back or retreat, destroy themselves en masse. The monsters awaken from their trance and a fight ensues. All three topple off a cliff; Ghidorah flies away, while those watching speculate that Godzilla and Rodan are probably still alive. Fuji acknowledges Tetsuo's important role in the victory and no longer thinks poorly of him. Sakurai states that he wants to send Glenn and Fuji back to Planet X to study the planet thoroughly (the English dub says they are to be ambassadors). The astronauts are reluctant, but make the best of the moment, happy that the Earth is safe. 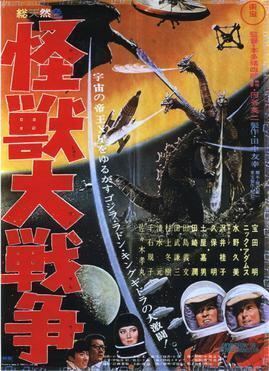 Invasion of Astro-Monster was the sixth Godzilla feature film. In the mid-1960s, United Productions of America (UPA) asked American producer Henry G. Saperstein to acquire high quality monster movies to distribute with North America. Saperstein approached Toho and began involvement in the film when Frankenstein Conquers the World was already in its production phases. The production of Invasion of Astro-Monster saw the film have input from American producer Henry G. Saperstein from the beginning of production and was his first fully-fledged coproduction. Saperstein has claimed to have provided 50 percent of the funding to the three monster movie co-productions he made with Toho. Saperstein felt that the screenplays by Shinichi Sekizawa were formulaic, noting that these films too often "opened up with a press conference or a government conference of scientists and officials" and that he convinced the production that they "needed to get into the picture a lot quicker. The conference could take place later on". The films script also incorporates an alien invasion theme that had been done in previous Toho films, but not in the Godzilla series. Saperstein also proposed the inclusion of an American actor to help market the film in the United States. This role was eventually filled by Nick Adams, who had previously starred in Frankenstein Conquers the World without any suggestion from Saperstein. Saperstein spoke positively about Adams referring to him as "terrific, a real professional. Very cooperative, always on time, ready with his lines, available, totally cooperative. He loved being there." The film had a lower budget than some of the previous films in the series. 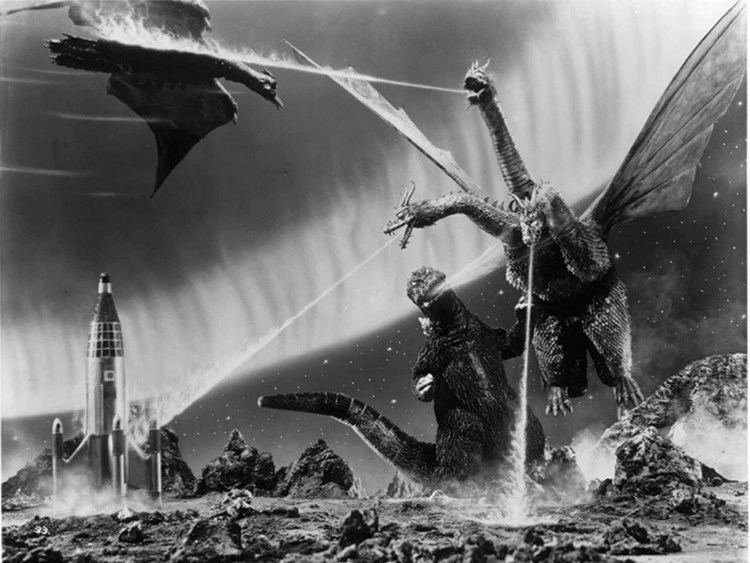 This led to special effects scenes having less elaborate model cities built and including footage which had been shot for previous films such as Rodan, Mothra, and Ghidorah, the Three-Headed Monster. Honda reflected on these inclusions, "It was a vicious cycle of time and budget... If we recycled scenes from previous movies, we could cut the effects budget. But then we received complaints from our fans saying, 'It looks weird, it's not fresh.' We could fool the audience for a little while, but eventually they would know the trick and stop coming to see the shows. Then the studio would think that special effects film don't sell anymore. It's no wonder we could not make anything good around that period... It is a sad story." 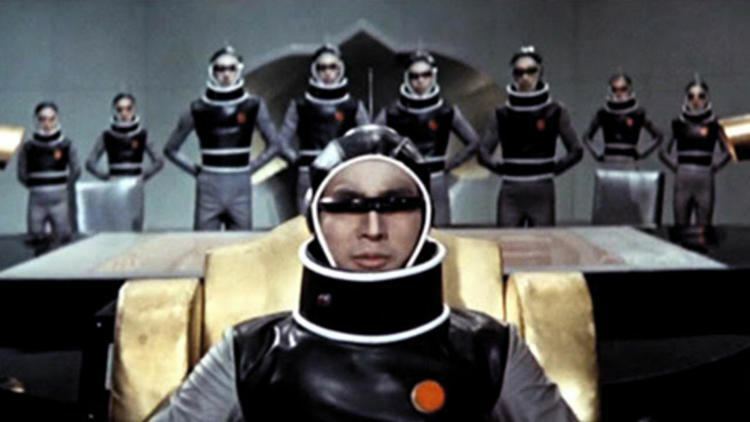 Invasion of Astro-Monster was released in Japan on 19 December 1965 where it was distributed by Toho. 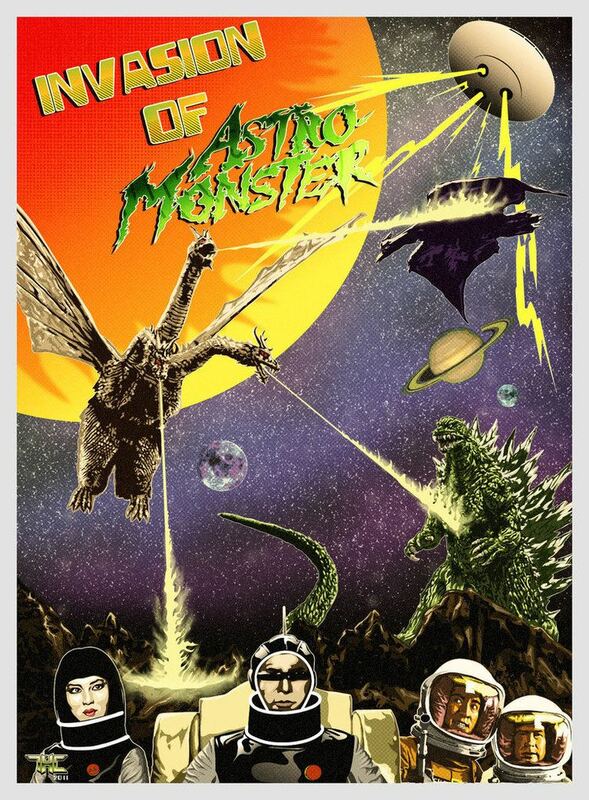 Invasion of Astro-Monster brought in about 3.8 million viewers in Japan on its theatrical release. Nick Adams' voice is dubbed into Japanese in the original theatrical release. It was re-issued in Japan in 1971 where it was edited to a 74-minute running time under the title Kaiju daisenso Kingughidorah tai Gojira (lit. The Giant Monster War: King Ghidorah against Godzilla). 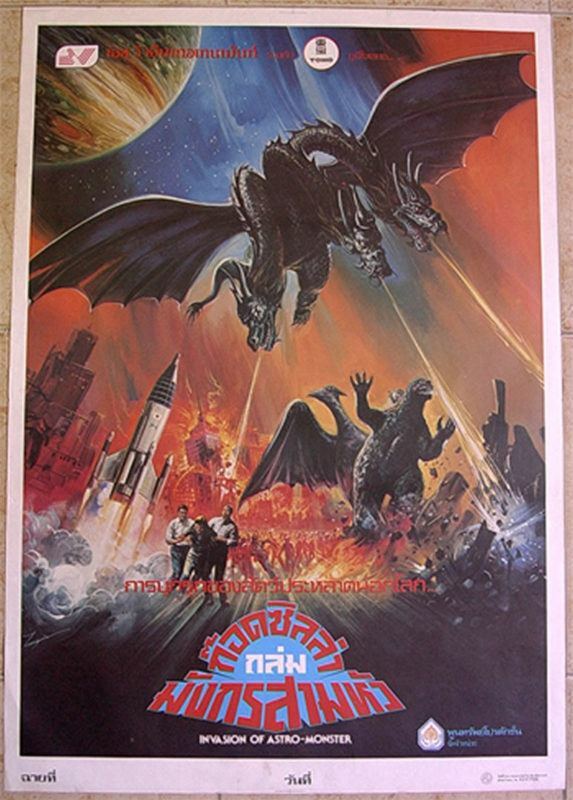 The film was released in the United States with an English-language dub as Invasion of Astro-Monster. It was released on 29 July 1970 where it was distributed by Maron Films. Regarding the time it took for the film to be released in the United States, Saperstein stated that Toho did not always want to release a film quickly for international release and that he had a lot of technical work to be done on the film. Variety reported that Saperstein had completed post-production in 1966 and was negotiating a distribution deal. Variety reported again in September 1970 that both the film and War of the Gargantuas "sat on the shelf at [UPA] because [distributors] figured they had no potential". Unlike some previous films in the series such as Godzilla Raids Again which were heavily edited on American release, the American and Japanese versions of the film were described as by David Kalat as "virtually identical". Among the changes in the American version of the film include improvised "Planet X language" scenes spoken by Yoshio Tsuchiya being cut, and a few brief shots involving the flying saucers at Lake Myojin. Audio was changed as well with sound effects added for Godzilla and several pieces of Akira Ifukube's score re-arranged. Home video titles for the film included Godzilla vs. Monster Zero. The American version had a running time of 92 minutes. The film was released on DVD in 2007 by Classic Media.